Involuntary Smiles: Life, Christmas, and Everything Before. Life, Christmas, and Everything Before. I recently read a book that described my life perfectly. The girl wrote that her life seemed to be like a book left on the porch in the wind, the chapters fluttering quickly from one to the next, scarcely resting on any to feel the breeze. How apt that description is! The week before Christmas was lovely. All my siblings came into town and it was lovely to visit with them all. I did have to balance watching my friends cute kids and family visits but it worked out. Friday, 2 days before Christmas was difficult, though. 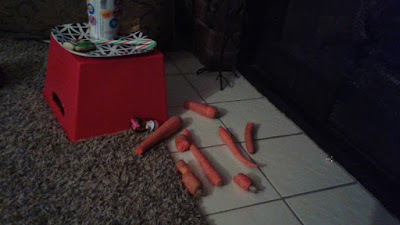 The kids were just naughty! 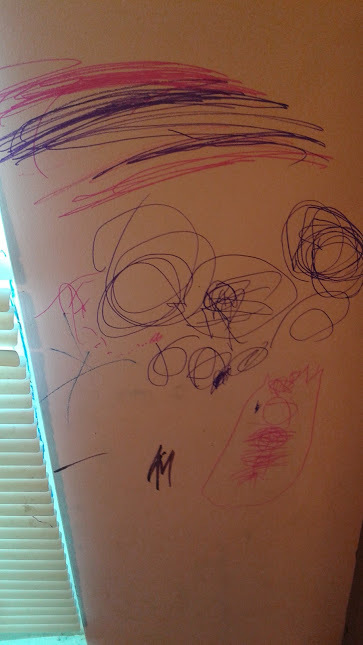 Taelynn and Beth found some Sharpies and went to town on the bedroom wall while I was feeding a baby. When I discovered it, I had them scrub it off with a magic eraser. Except Tae shoved Beth, she hit her head on the bunkbed. 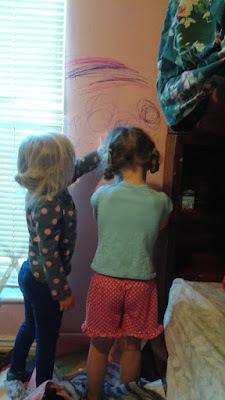 I asked her why she did it, and she just kept whimpering, "I don't know," and so I told her that she needed to scrub alone, if she was going to injure her helpers. After a little while of scrubbing alone, and she did a fairly good job considering it was Sharpie. After Tae scrubbed for a little while, I went in to comfort her, because she had been crying the whole time. I scooped her up on my lap to comfort her, and felt her head. She was hot. Oh dear, that is NOT what I needed! But her excessive grumpiness suddenly made sense. I tried to take her temperature, but she nearly gagged trying to put it beneath her tongue, so although it isn't nearly as accurate, I put it in her armpit. 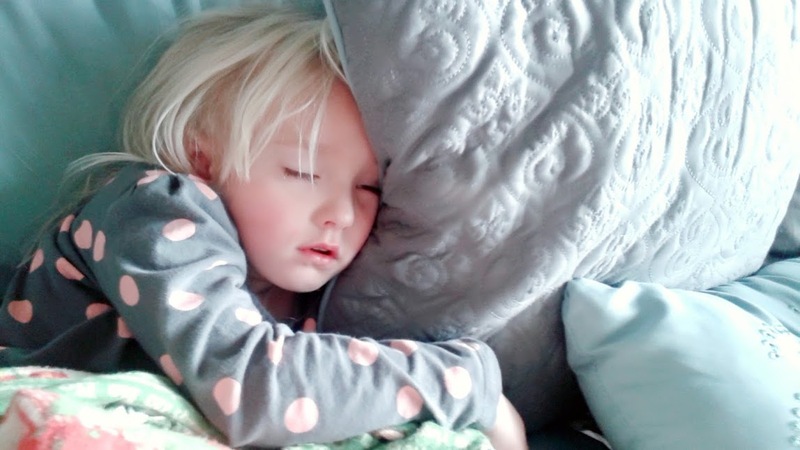 Yes, she had a fever, poor girl. And then she tried to get sick on top of it all, to top it all off. While I was taking care of Taelynn, Beth dumped a bottle of orange soda all over my floor and commenced trying to slurp it up, giving herself an orange chin and nose tip stain. It stayed like that for a day or too, even. Her nose and chin, not my floor. I also found cute little footprints tracked through the soda, around my kitchen, and then down the hall. I honestly laughed as I was cleaning it all up because when it rains, it pours! Meanwhile, babies were tired and didn't want to sleep, someone dismantled the baby gate, one of my favorite Christmas books got Sharpied, and the older kids were at each other's throat, and Brynlee decided she was sick. I think she just wanted the medicine because really, she was fine. When the other kids had gone home, I pulled out the egg nog and the ugly sweater cookies to decorate. I wanted to do them with the girls I watch, but there was way too much fighting and I couldn't find a moment of peace to pull them out. 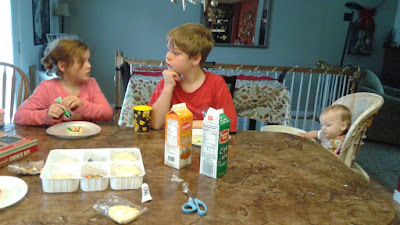 But Keith and Faye had a blast decorating and listening to Christmas music with me. And then we had a family party that night. 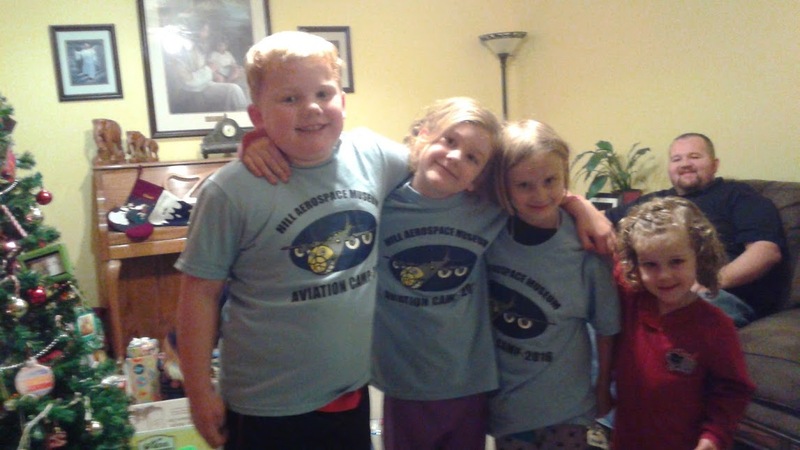 See the entry picture of Faye with her cousins, sporting their matching shirts. Keith didn't want to wear his. Christmas Eve Jeffrey got sick. In all honesty, I really did laugh at all the chaos. I mean! It was like I was being given material for my blog! 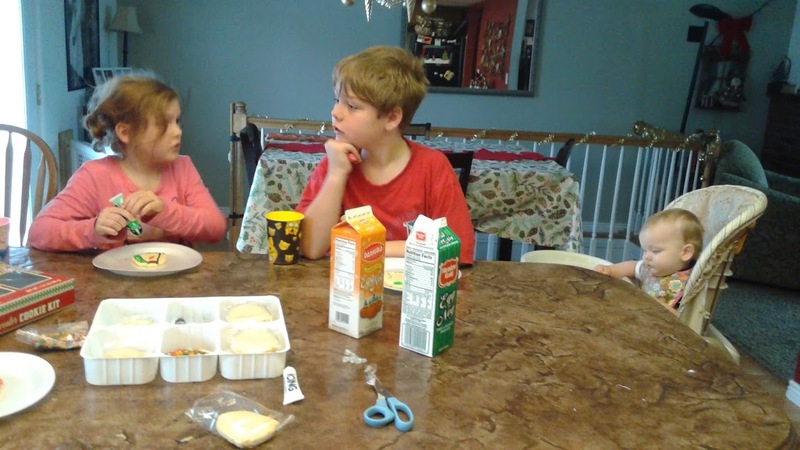 The kids and I watched Home Alone for their very first time. Of course they loved it. What 9 year old little boy wouldn't? Slap-stick comedy galore! Jeffrey went to bed early, and I stayed up making some shirts for Keith, and a journal. I then put all the gifts beneath the tree and had to write a letter from Santa to Faye because she had left him a three page letter. And I had to make sure the carrots were nibbled on. Jeffrey had eaten the sandwich and drank the milk. Needless to say, I didn't get to bed until too late. But all that snow that just dumped! was amazing! There really is nothing like waking up Christmas morning to a fluffy blanket of snow all wrapped up cozy around the house. It was absolutely idyllic. 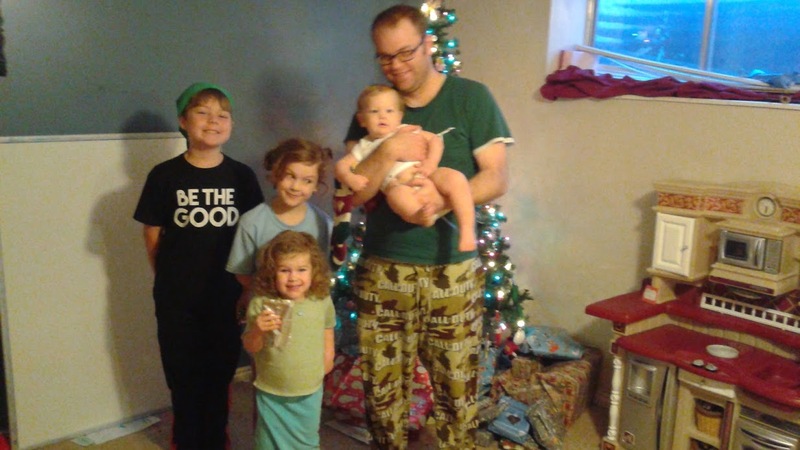 I really wanted to go to church before we opened the gifts, but we were sort of snowed in, so we had a gloriously tranquil day of pajamas, cocoa, and the kids going berserk over their gifts. 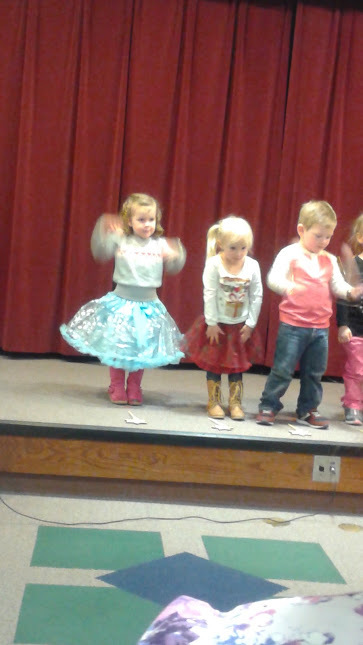 And this is just Beth in her preschool program. 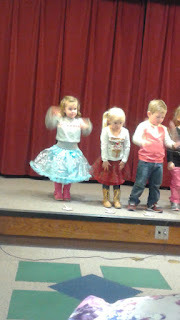 She spent most of the time on stage admiring her skirt, and it was adorable! She insisted she wear that skirt.